The Drinkable Book has been designed with pages made of special filter paper coated with silver nanoparticles that kill microorganisms such as cholera, E. coli and typhoid, major causes of preventable, and often fatal, waterborne diseases. In laboratory tests, the filter successfully removed 99.99 percent of bacteria, achieving a drinking water quality level comparable to that of the United States. The filter is a simple system to use — simply tear out a perforated page, insert into a slot in the filter box (supplied with the book) and pour contaminated water through the filter. Clean water is produced in seconds and captured in the reusable box. Each “filter” page can be reused up to 30 days, and one book can last up to four years. 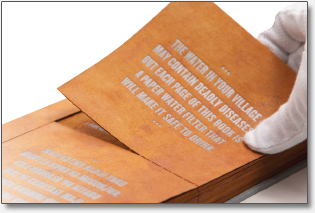 The Drinkable Book serves two purposes — creating clean drinking water and educating individuals about safe drinking water habits. Fundamental hygiene messages, such as the importance of regular hand washing and keeping drinking water away from human and animal waste and garbage, are printed on each page in a safe, food-grade ink. The Drinking Book has the potential to save millions of lives. Prototypes are being field tested, and fundraising is underway to support large-scale production. What other aspects of a person’s life can change when drinking water is made easily accessible? How could The Drinkable Book be valuable in developed countries as well?